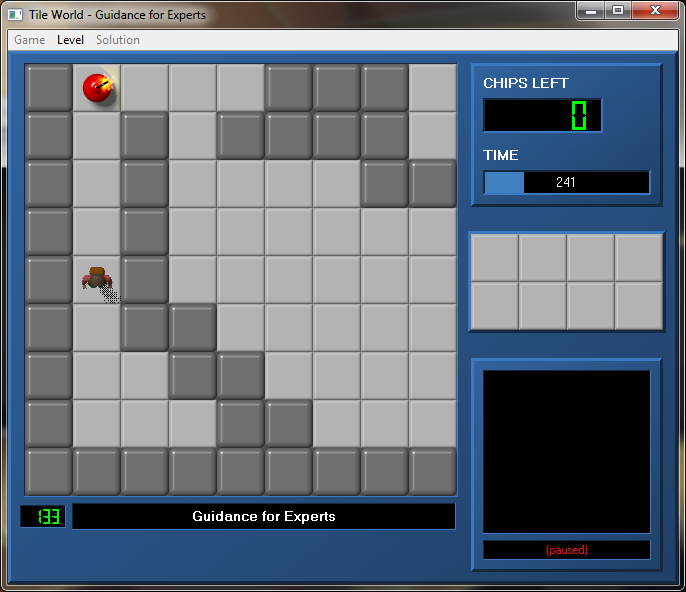 JoshL2 - Level Discussion - CC Zone: The Next Level - Chip's Challenge/Tile World website! So...how do you like the set? I'm starting to consider that this should be my 1st set, since to me, JoshL1 is just crap compared to this one. But I would love some feedback on JoshL2! I think it is one of the best sets I have played. The only thing I've been finding to nitpick recently is the many long linear levels, which sometimes makes it easy to miss a chip or two, or three or four. Of course, my full opinion is in the LP which you've already seen. Long linear levels is my main style of level making, though this style slowly breaks the farther you progress in this set and judging where you currently are in the LP, your getting to that breaking point. On a side note, I'm strongly considering on the replacement of Double Pain for obvious reasons. The decision to do this is up to the community whether I should do so or not. FROZEN LABYRINTH IS THE BEST MAZE EVER. Updated the set yet again. I changed many time limits to various levels and made one untimed now due to extremely difficulty. Also made some slight modifications to various levels as well. Guys, I forgot about 1 thing... apparently there is a mistake on Level 67 - Line Maze. There is 1 extra chip I forgot to count in. Please use the editor you use to fix this yourselves, as I don't wanna waste everyone's time to hassle with such a small mistake. I think this won't be surprising but I updated the set. I just made 2 levels a bit easier and made 1 level have a concept that is very rarely seen in the CC world, but still includes the theme of guesswork. You'll have to play the level for yourself to better understand. It's 83. Because I found level 94 to be way too boring and tedious, I replaced it with a brand new level was an interesing concept. Please be sure to update!! Also a minor update along with this, time limit of 93 was increased by 200 seconds. Now time limit of 750. Playing this set and stumbled upon a problem in #78 Vatfilter: In Lynx Mode, Chip cannot escape the room with the 6 traps and chip to the left of the green lock once he enters because he always slides over all the traps and past the door. Replacing the fire below the trap line with a wall would allow him to stop and turn, fixing this problem. Other than that, you've got a lot of neat levels and concepts there! Some look to be pretty difficult, though. Oh didn't notice that! Thanks for letting me know! Yeah there are some difficult levels in this set, but this is my main one, which has a lot of variety when it comes to difficulty. JoshL3 is my hardest set, and JoshL1 can be considered my easiest I guess. It's more of a pathetic set to be honest lol. I've only played about a fifth of the levels. (I don't have a lot of free time, so I only played levels that looked easy and/or short.) I'll comment on some of my experiences with some of the more interesting levels, along with my times for them. #28 Secondary Shifting (351/650 seconds) -- A fun and different take on block pushing. This level forced me to suppress my instincts not to push blocks to locations where I can't retrieve them right away. #62 Closed Track (137/300 seconds) -- A good puzzle that wasn't too difficult. The end confused me, though, until I went into a teleport, found a force floor under the block, went back, and slid into the exit without even meaning to. #70 Frozen Labyrinth (336/600) -- A highly original concept for a maze. Made all the more interesting by the fact that there are a couple -- just a couple! -- of places where you actually can slide across the ice for a shortcut. I don't know if you intended these mini-shortcuts (one vertical one near the right side a bit less than halfway down and one tiny horizontal one 3-5 spaces left of the socket) but I think they actually add to the experience of playing the level (by rewarding alert and/or curious players) rather than take away from it. In any case, I would vote this level for CCLP1. #74 Explosives (684/800) -- This level was both shorter and more interesting than I expected. After playing it for awhile, I discovered that it has the surprising property that half of the bombs are impossible to destroy unless you visit the bottom-right corner and use a block from there to get them "started." Unfortunately, I was able to solve the level without visiting the bottom-right corner at all. I say "unfortunately" because I think it would have been a more enjoyable and challenging puzzle if you had required double-bridging to reach the exit, which would require the player to notice and take advantage of the property I described above. #83 No Turning Back (380/400) -- After the update--while I have never before seen the tile combination you used in this level, the concept of "no turning back" doesn't really exist anymore--if you take the wrong path, you can just turn around and try a different one. #95 Mega Blocks (389/900) -- Looks really hard, but is rather straightforward. I will admit to (ab)using block slapping to get rid of the bomb under the block because its presence was making me feel nervous. I also got pancaked at the one point in the fire/water/ice room where you have to push the block, follow it without being able to see where it landed, then instantly step out of the way after pushing it. On the other hand, I did have a moment of extreme skill: at the end, I accidentally cloned one too many s, yet I managed to snag the 3rd-to-last chip with perfect timing from the that was stuck in the little area next to it. #112 Ocean Currents (242/500) -- A challenging and original puzzle. The only things I didn't like about it were that it was hard to tell where to go next at some points and there was very little leeway with regard to stepping off the force floors at some points. #114 Jungle Rumble (290/450) -- A nice easy level for its location in the set. This was fun to play and seemed like it would go nicely into CCLP1. #123 Revisiting the Prison (232/300) -- This one took me a few tries and was harder than it looked. I got cornered a lot because the nine teeth kept splitting up when they encountered obstacles, coming at me from both directions. It was an enjoyable level, another worthy CCLP1 candidate. All in all, this set contains a large variety of creative ideas. The only issue I have with it is that about an eighth of the levels (6, 7, 15, 24, and 69, for instance) seem like they belong significantly later in the set, while others (70, 78, 113, 114, 117, 118, and 121, for example) seem like they belong much earlier based on their difficulty. The difficulty of the set is randomized, which I highly prefer than something like how CCLP3 is. There are a good 5-8 simple levels towards the end of the set. @62: The ending is weird I will admit. It's intended to be a "dafuq?" moment to players lol. @70: This is one of my levels EVERYONE in the community seems to really love and claim it's the best maze ever. I did in fact purposely leave in those shortcuts, mainly for optimizers and searching for the bold of the level. Your reasoning also makes sense to non-optimizers as well! Glad that you loved it! @95: That was a good last minute save towards the end! @123: Was designed with CCLP1 in mind. I was about to create a level called "Jungle Rumble" for my set...I had no idea the title was used here already! Great minds think alike. I got it from Frogger (PS1). Oh man, I loved that game. I ought to name a level after one of its levels too. Updated JoshL2. I noticed in the editor the starting point in 111 was totally wrong. I don't know if it was included in the last time I updated, so just in case I fixed this. Updated the set once again and this one is extremely major. I replaced 107 with a much better level and also added in a little surprise somewhere in the set I also changed a few time limits, including making the greatly hated Double Pain (23) untimed. Hey it's mmoraleta (Martin) with yet another feedback discussion. I know this topic is quite old and the set is quite old but I wanted to say some stuff about the set that I wanted to say before when I first played it. I have recently replayed it and I have some things to say. Overall, this is a fun set with hard and easy difficulties throughout. Now Josh, I remember in your current LP of this level that back then you didn't care too much on feedback but I am putting this out there out of my mind. I have to say though that your level designed has greatly improved over the years. 1. Nice first level with moderate puzzles. A little medium for the level 1 slot though but nevertheless great. 2. I found the flippers early on in the level that saved me a lot of block pushing. I don't mind block pushing level though. 3. Easy level and sort of funny. 4. This level despite it's pretty straightforward puzzles, is pretty boring for me. 6. Pretty fun level. Is this level based on "In The Walls Of Gravel Castle"? 7. Annoyingly confusing melee level. I can't say I like this level. The ball collisions are annoying. 8. Annoying walkers at the start of the level get their payback at the end. Okay item swapper level though. 9. I said it before and I'll say it again I don't mind tedious block pushing levels but the item swapper twist make this better. 10. Cool blue levels are cool. 11. Nice small guide the glider level, except your creating a path for the glider. 12. Okay level with teeth. 13. I had a lot of fun with this level even though it is more of an average level than a sokoban based on the title. 14. Somewhat chaotic chip collecting level. I'll take this level more than "Fireball Territory". 15. I liked "Memory" from the original game but this one is quite hard and annoying, namely the tanks. Luckily, it's a short level. 16. Awesome level. The teleport to the right of the block cloner next to an ice tile is pretty cruel if there is a block cloned. 17. Simple block to bomb level. 18. This level is a better than "Knot" from CC1 in my opinion. 19. I am not a big fan of "I Slide" levels. 20. Very cool concept, I really liked this one. 21. A tad too much of of monsters however the ice slide at the start as well as a single water and fire tile are appreciated. Saves a little bit of the chaotic monster dodging. 22. I didn't find this level too entertaining. Fortunately, I am pretty adept with chip snatching. 23. Simple but extremely tedious level. Listened to dubstep while doing this level. 24. This level is short but NOT simple. 25. This level isn't that bad, the only parts I didn't like are the block and roll section and the key puzzle in the lower left. 26. Has moderate difficulty, the glider section and the guesswork 50/50 at the end make the level less fun. 27. Interesting ball melee level. In the end I was able to leave one recessed wall behind. Not sure if that's intended. 28. Pretty easy level but tedious. 29. Based on the title, I would've raged if Chip hit a glider in the flipper room after all that block pushing. However, a section of the block pushing has a little twist that makes it less boring. The flipper room would've been better off without the gliders. 30. Also a pretty easy level and a little satisfying of the frogs drowning at the end. 31. Cool concept of a level. 32. Like level 21 a tad too much of bees here. The water space in the middle is a contribution though. Despite me hating walkers, I prefer "Going Underground" than this level. 33. Nice level in reference to "Block Out" from CC1. 34. Gameboys, oh the good old days of video games. 35. Medium teeth directing level. Little more difficult for dummies. 36. Also not too bad of a level, didn't like the walker section though. 37. Really fun chip collecting level. 38. As tedious as the original level was, I prefer this level. 39. The bee in this compressed maze isn't too bad. Lot's of twists and turns should keep it at bay as long as you keep track of it. 40. I like the trap section but the walker section reduces my rating for this level.